Pope John Paul II's funeral will take place on Friday morning in Rome, the Vatican has announced. His body will lie in state in St Peter's Basilica from Monday evening until Friday morning, with the church staying open late into the night. Pilgrims are massing on St Peter's Square to see the body carried across in a procession from a Vatican hall. 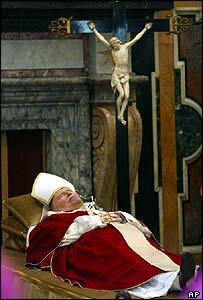 Rome's mayor said it would "grind to a halt" for the funeral of the Pope, who died on Saturday after a 26-year reign. "It will be a moment without precedent," Mayor Walter Veltroni told Repubblica radio. The number of mourners paying their respects could reach two million. St Peter's Square is dotted with impromptu memorials of flowers and candles, while handwritten messages are stuck to street lamps with wax. "Goodbye, father, hero, friend," read one message. "It scares me to see a dead body, but this is our Pope and I have to say goodbye," mourner Roberto Comelli told Reuters news agency, after spending all night on the square to be among the first to see the body. The funeral, scheduled for 1000 (0800 GMT), is likely to see one of the biggest gatherings of world leaders in recent times. Cardinal Joseph Ratzinger, tipped by some as his successor, will preside over the open-air ceremonies on the steps of the basilica. 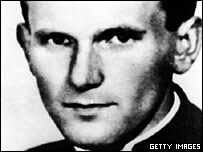 John Paul II will be buried in the crypt beneath St Peter's Basilica immediately following the funeral and a Requiem Mass, the Vatican's spokesman announced. The Pope had not stated any wishes about his last resting place, Joaquin Navarro-Valls said, and the Vatican would therefore "follow tradition" by burying him at the basilica. Some had speculated the Polish-born Pope might have wanted to be interred in his beloved native country. Mr Navarro-Valls said 65 cardinals had met in Rome for about two and a half hours to read the Pope's will and fix the funeral date. The meeting was the first time the "princes of the Church" had met since his death and more are due to arrive, coming from across the world. The Pope's body will make its way to the basilica at about 1700 (1500 GMT) and public viewing will begin three hours later. The basilica will only close between 0200 and 0500 each day for maintenance. 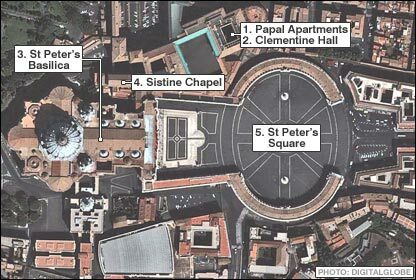 Church leaders, Vatican staff and prominent Italians have already viewed the Pope's body at the Vatican palace's Clementine Hall. The palace has been filled with clerics and Vatican officials singing hymns and reciting the Rosary prayer. Bishops and priests prayed aloud as they knelt beside the Pope's remains. With Roman hotels and guest houses already full, makeshift shelters are being created for visitors at sports grounds. Giant video screens may be installed to relay the ceremonies. Cardinals will deal with the day-to-day running of the Church until they elect a new pope at a conclave later in the month. BBC religious affairs correspondent Jane Little says preliminary meetings provide an opportunity to raise general concerns about the shape and future of the Church. There are nearly 200 cardinals involved in the consultations, but only 117 of them are under the age of 80 and therefore entitled to vote for a new pope.